. 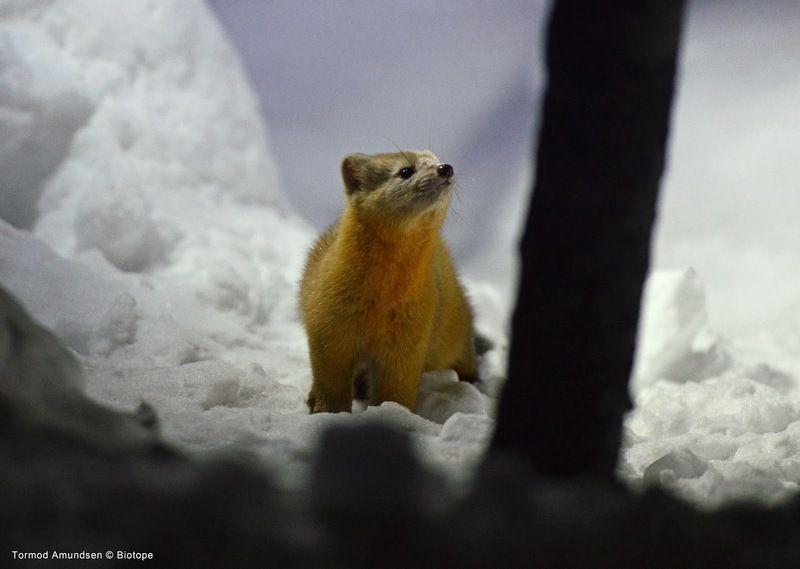 East Hokkaido has many similarities to Varanger. One would perhaps not think this is the case, but the other end of the palearctic ecozone in many ways mirror our own region, Varanger: In winter east Hokkaidos climate is very similar to Varangers. It is dry and cold, the temperatures easily drop 10 degrees and more below zero. 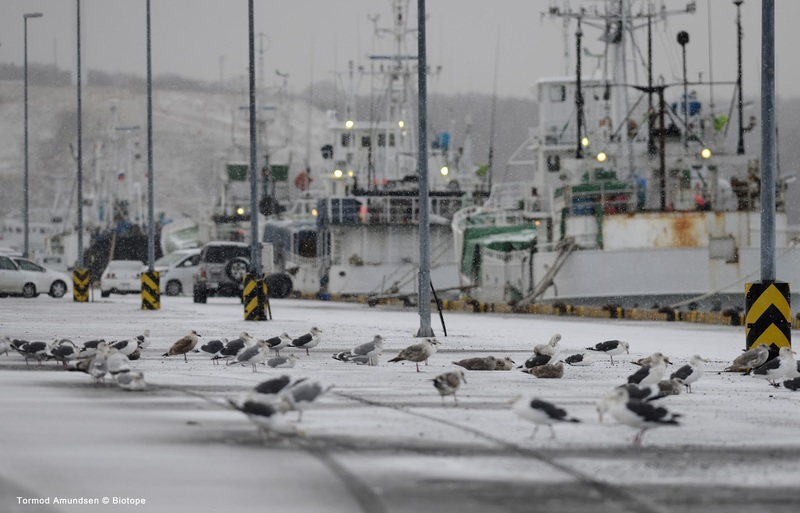 Just like in Varanger the cold weather from Siberia heavily impacts the local climate. 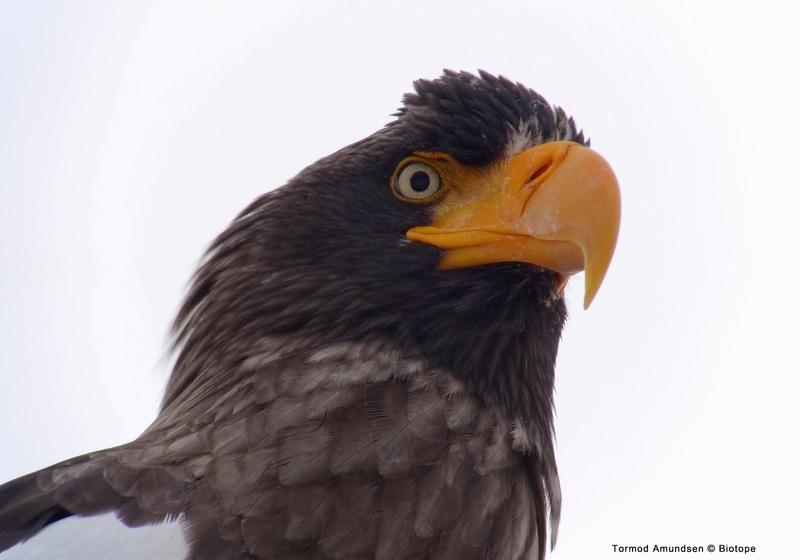 Steller´s Sea Eagle, the worlds largest eagle. Notsuke, eastern Hokkaido, January 2014. Close up digiscoped with Swarovski ATX 95mm + Sony RX100m2. 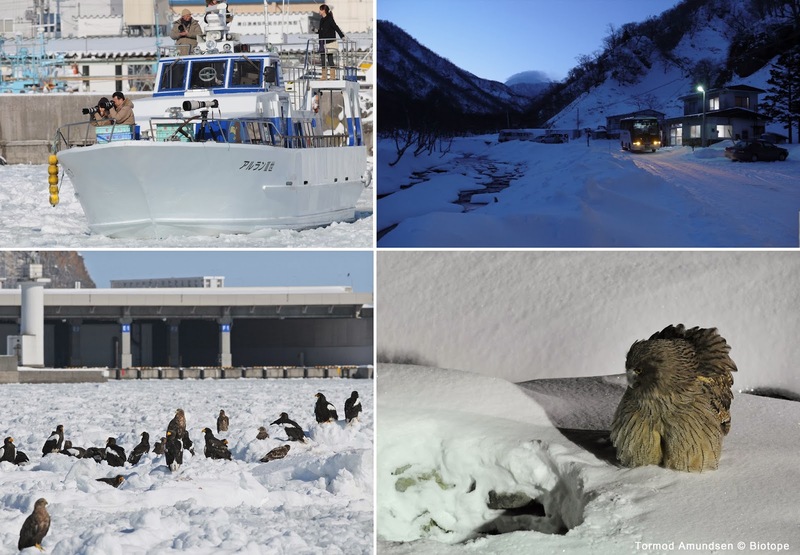 The aim of our Japan trip was to study and look into similarities between eastern Hokkaido and eastern Finnmark. And of course to do some inspirational birding, as eastern Hokkaido is home to some of the most iconic species in the world! 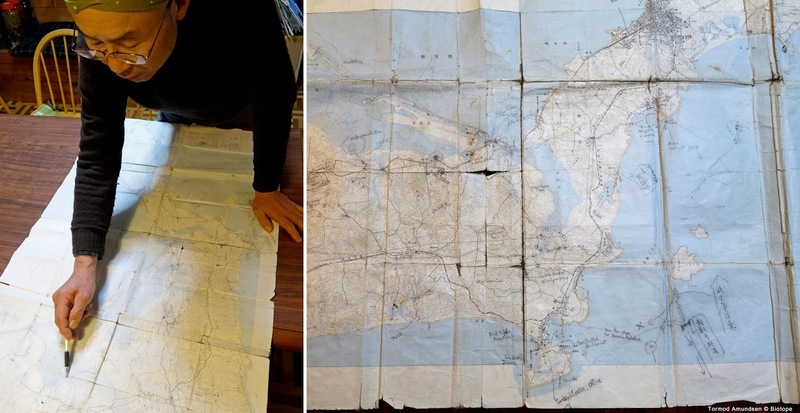 The following trip report, is perhaps a photo essay more then an article. I hope the photos of birds and places can be of inspiration to anyone looking into a winter trip to eastern Hokkaido. I can highly recommend it, if you are into birding a place where the number of species is not the highest but the species themselves are absolutely amazing, and often seen in spectacular numbers. 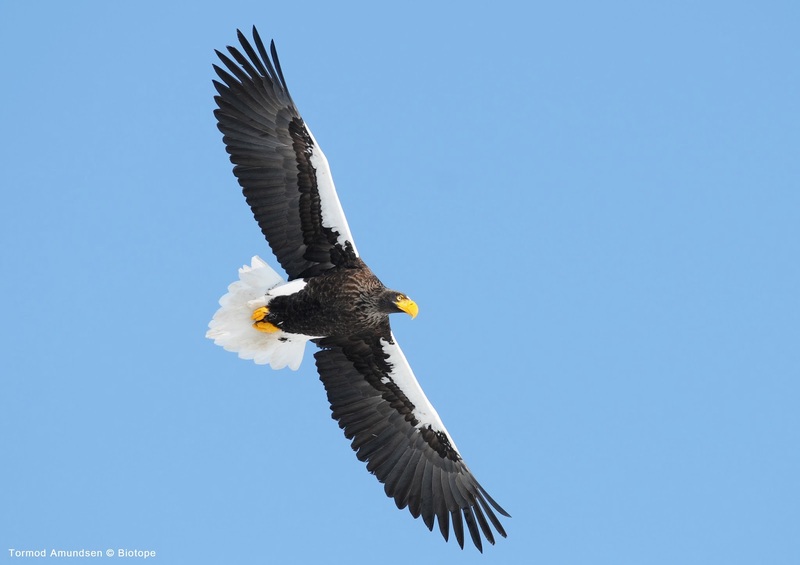 Seeing Steller´s Sea Eagles in many hundreds are a privilege, and an experience of a lifetime. And if you are into seafood and raw cuisine, Japan also offers some of the finest dining available. Even if English are rather rarely spoken, it is a pleasure getting around, as you are met with friendliness and helpfullness wherever you go. 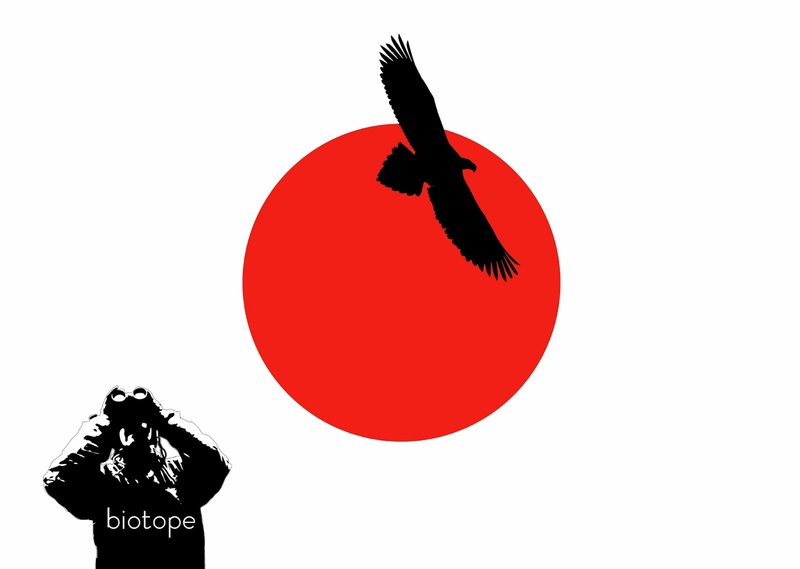 I advice any birder to do rather solid preparations before a visit, as it will help you get around more easily, and to be specific about things when asking for help when in Japan. 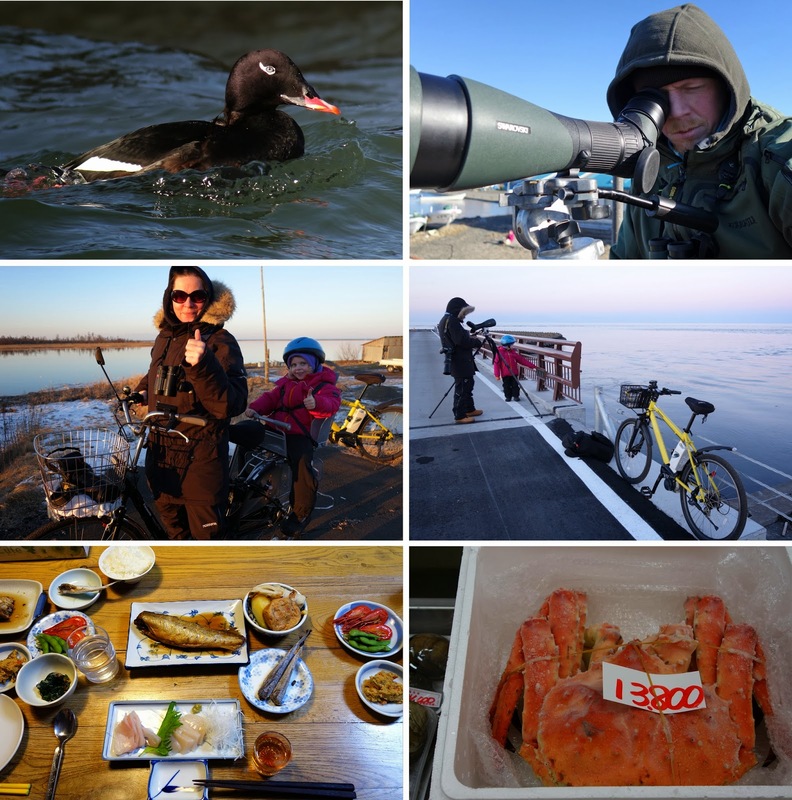 There are many trip reports from Japan and Hokkaido online, and I hope this one will add to the pool of information about this very cool birding destination. 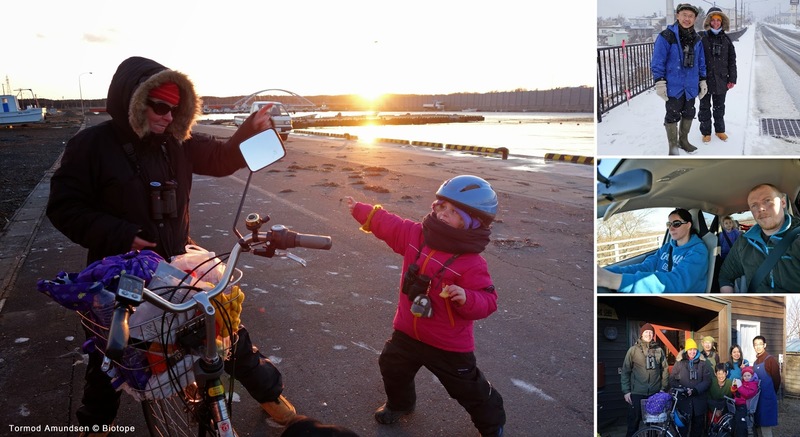 The family birding team: Biotope is a small pro nature business based in Varanger, started by birders & architects Tormod and Elin, with the great support of our daughter Lila, field birder and tester of bird hides! 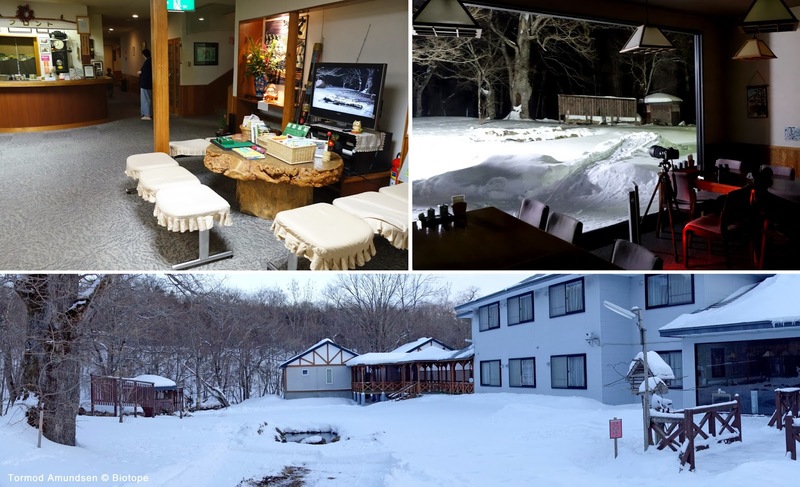 In east Hokkaido we stayed at another birding familys guest house, Lodge Furen. We met owner Takeyoshi Matsuo and his wife Masako back in 2011, when we stayed at their guest house for a few days. This time we made their guesthouse our base camp for most of our time in Hokkaido. Great people, great food and spectacular birding in walking distance from the guesthouse (contact Takeeyoshi at email: matsuo-t@plum.plala.or.jp). 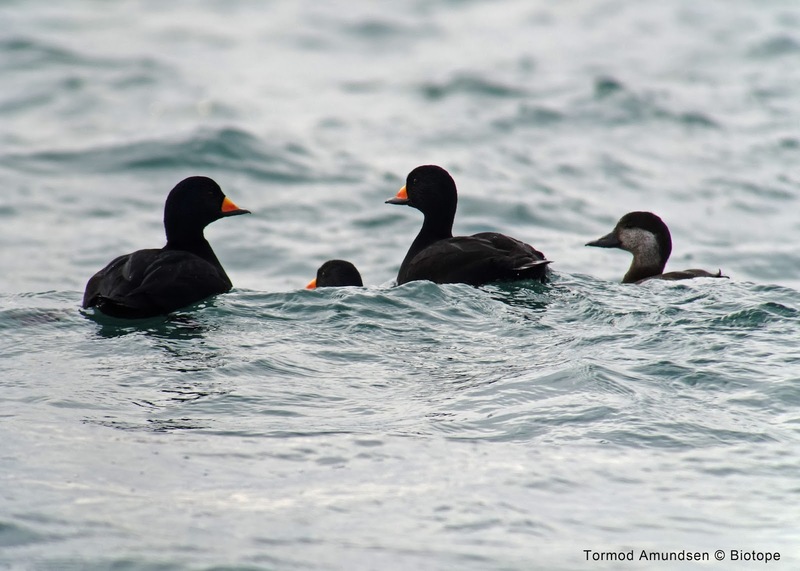 Like in Varanger sea ducks are everywhere. 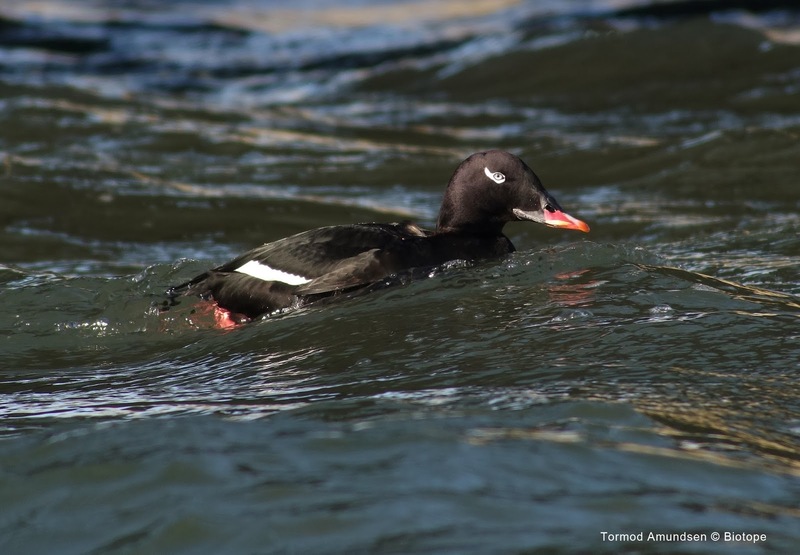 This stylish drake Stejneger´s Scoter seemed to favour the currents around the bridge leading out to the Lake Furen nature reserve. This was also a target bird on our trip, and I hoped to be able to do some decent photography of this species on this trip. This bird was fairly confiding, but still it kept its distance. This was a great opportunity to test digiscoping with the Swarovski ATX 95mm telescope, as the distance was to long to do decent species portraits with my Nikond800/300mm combo. The above photo was taken with a Sony RX100m2 hand held to the Swarosvki ATX 95mm telescope. 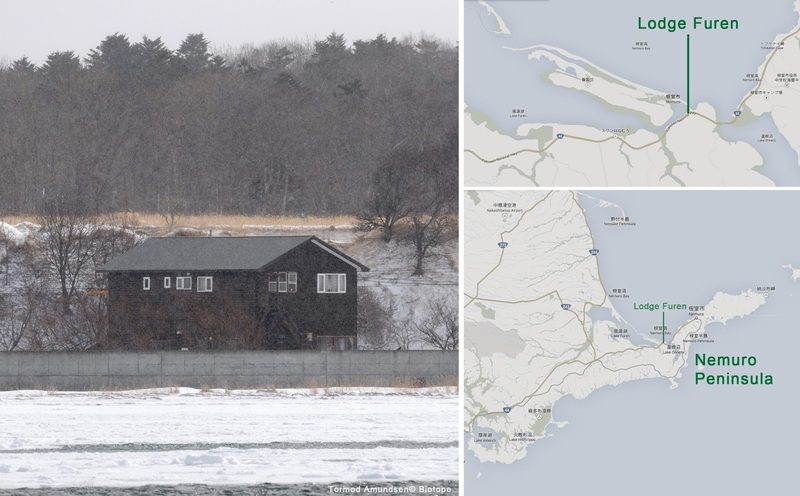 Like in Varanger, you can find towns in East Hokkaido that are entirely devoted to fishing, but nevertheless these places can be spectacular bird sites. 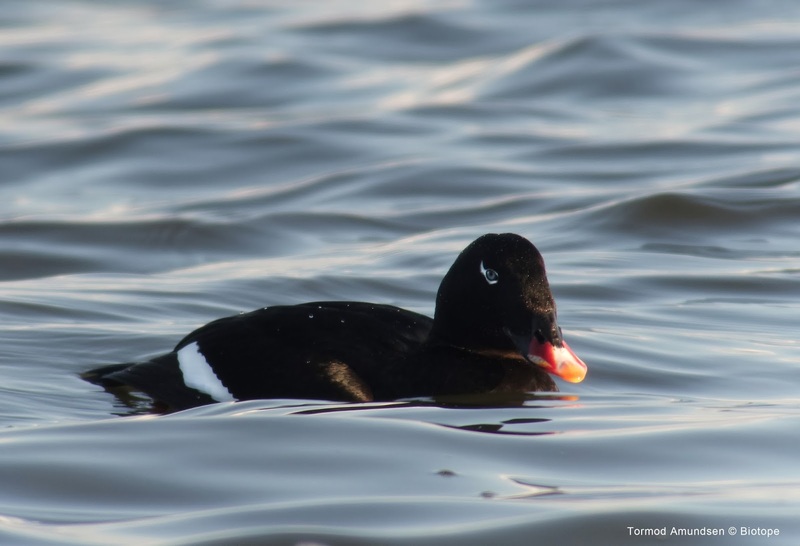 People and birds often share preferences in landscape, and for many ducks and gulls sheltered harbours are welcomed resting places, and if they are shallow too, then they are often great feeding grounds. 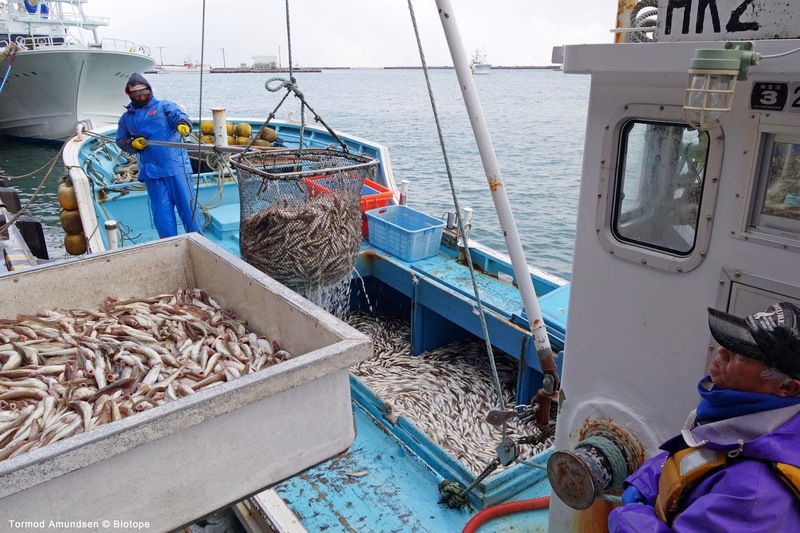 When these harbours are close to rich fishing fields, typically near strong ocean currents and where different bodies of water meet, then the conditions both for birds and fishermen are ideal. Hanasaki fishing harbour, south Nemuro Peninsula. Habomai fishing harbour, outer Nemuro Peninsula. Fishing vessel, coming in from the fishing fields where the Sea of Okhotsk meet the North Pacific Ocean. Fishermen unloading their catch at Habomai harbour. 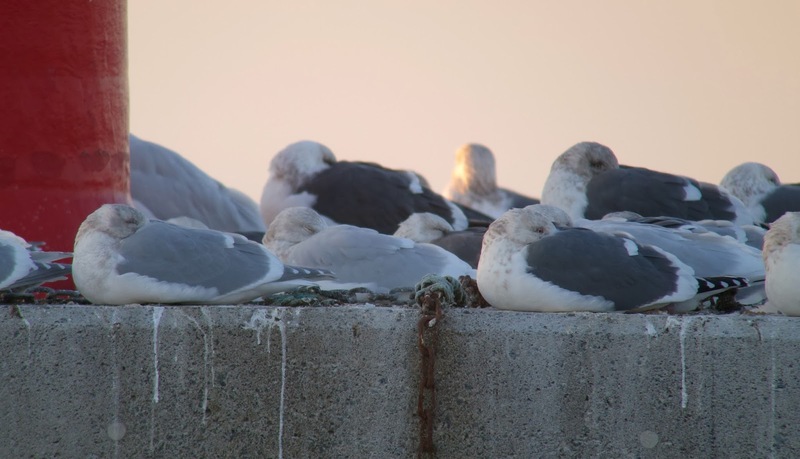 Gulls and ducks not only find shelter in the harbor, but scraps from the fishing industry provide food too. Inner harbour breakwater, Hanasaki harbour. Although the Japanese harbours are obvioulsy larger then Varanger harbours. 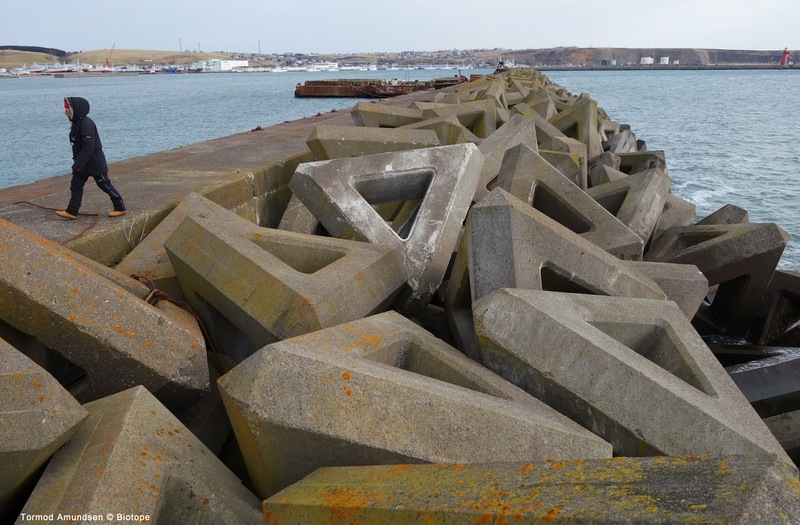 If in Varanger, take a trip to Berlevåg harbour, where the tetrapod breakwater will give a similar impression to the above breakwater. They are the birds most assosiated with fishing harbours. 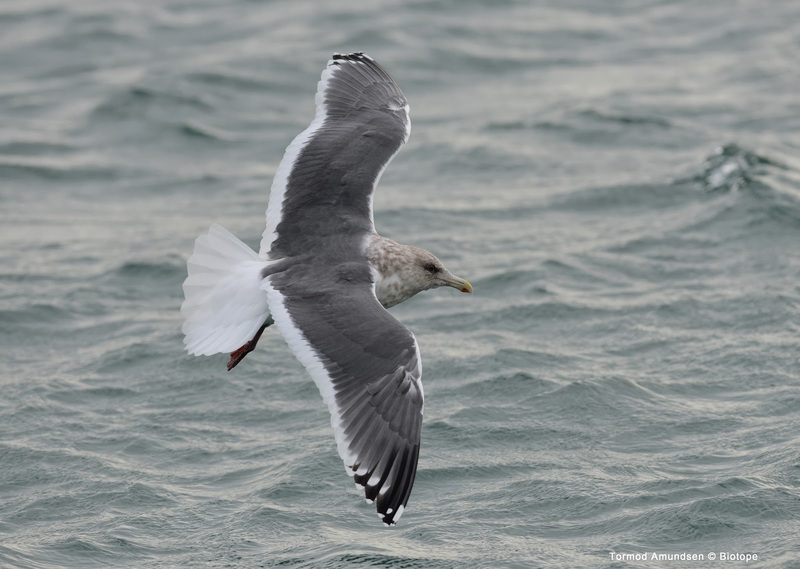 As keen birders we where interested in studying japanese gulls, and practising our ID-skills in case one of these eastern species finds its way to Europe. 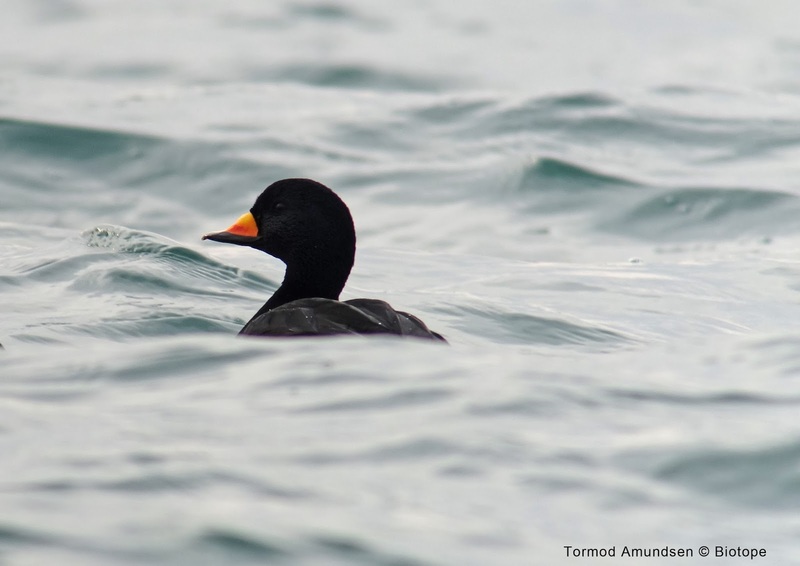 It has happened before, and with increased knowledge of plumages one increases the chance of discovering one in lets say, Varanger. Nice comparison of upperpart grey tones. 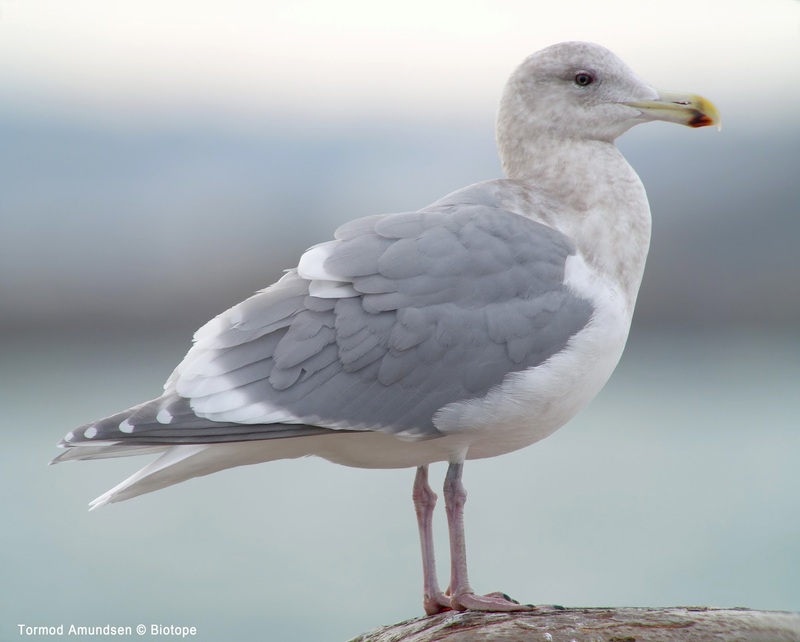 From left to right at front, Glaucous-winged Gull, Glaucous Gull (pallidisimus) and Slaty-backed Gull. Nemuro, January 2014. digiscoped with Swarovski ATX 95mm + Sony RX100m2. 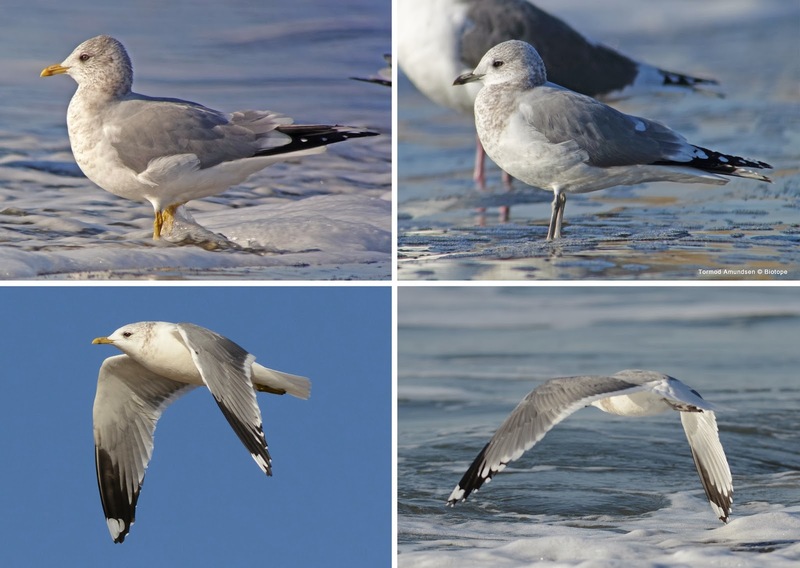 Kamtchatka Gull (left) vs Common Gull ssp heinei (right). 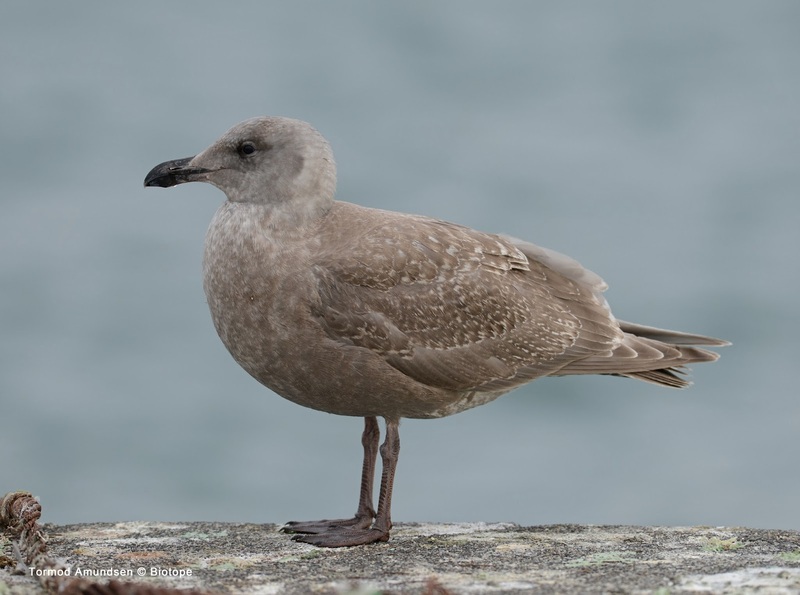 Kamtchatka Gull was by far the most common Common Gull. But we did see a few ssp heinei Common Gulls too. Great to be able to study these birds together! Above photos are heavily cropped digiscoped photos. Black Scoters in Hanasaki harbour, digiscoped. Although Japan is a densely populated country, their northeastern regions are sparsely populated. The Varanger Peninsula is home to approx 10 000 people. East Hokkaidos top birding region, the Nemuro Peninsula is populated by no more 20 000 people. 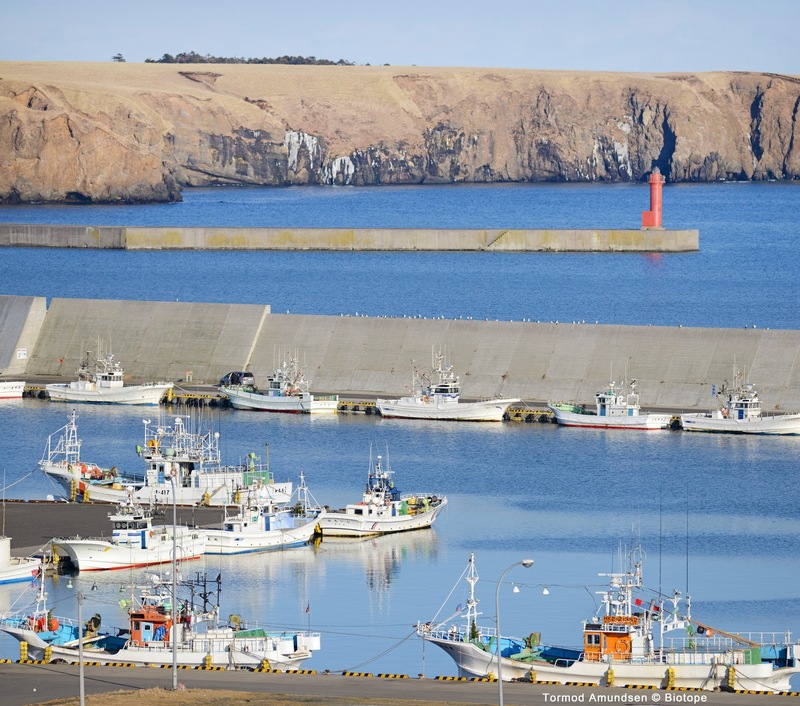 Spread around eastern Hokkaido you find several fishing towns and harbours. They are all worth checking out bird wise, although we found Hanasaki and Habomai harbours to have most activity both people (fishery) and birds wise. Ochiishi was also quite good. Panorama of northwest side of Hamanaka town (Kiritappu). A good place to find Asian Rosy Finches. Panorama of southeast side of Hamanaka town. Empty houses and other buildings are found everywhere. Many places we visited are clearly not geared towards tourism at all. But then again, that is one of the exciting things about being a birder: the sense of exploring and finding new places. From an architects point of view this is a bit of an adventure too. In eastern Hokkaido it also seems birding is picking up, and it seems locals are becoming quite aware of the potentials in nature based tourism. No doubt a great thing for both birds and people. 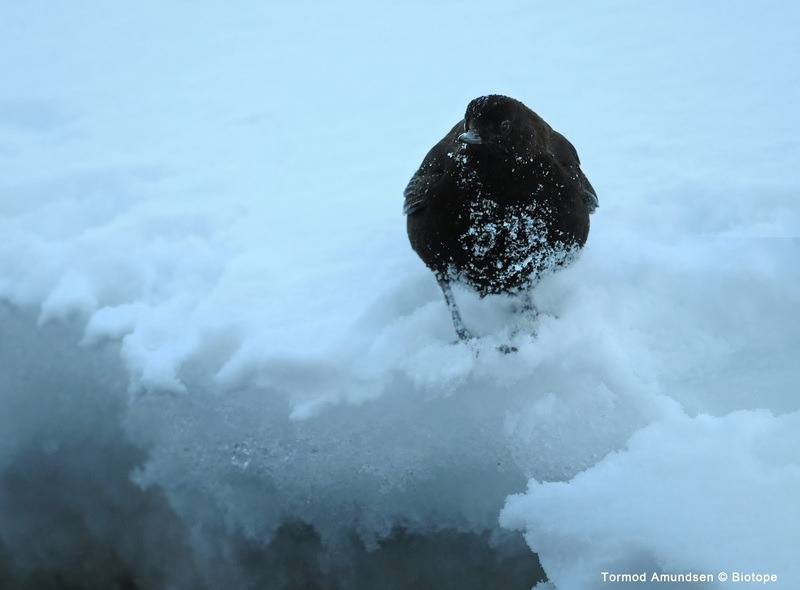 Like we have seen in Varanger the past few years: with the increase of visiting birders the awareness of our regions unique birdlife have grown considerably. This in turn leads to taking better care of and appreciating the birds and nature around you. It is not too often the case, but in these cases what is good business is also good for nature! In winter east Hokkaidos climate is very similar to Varangers. It is dry and cold, the temperatures easily drop 10 degrees and more below zero. Just like in Varanger the cold weather from Siberia heavily impacts the local climate. Above are fishermen prepping their nets for ice fishing. 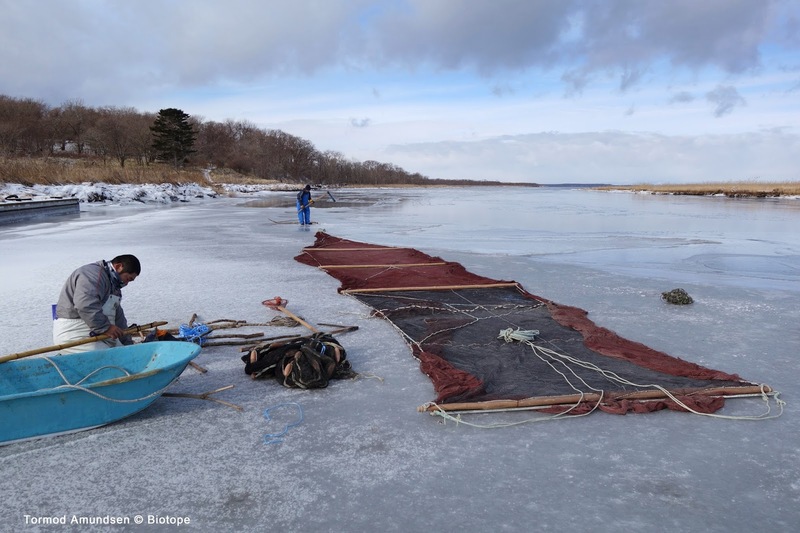 In Hokkaido ice fishing is done both for business and for recreation. Lodge Furen or the Minshuku Furen, is one of the top places to stay in Nemuro region. Staying at Take´s Lodge Furen is a very easy going laid back experience, where everything is set up to cater to birders, like early breakfast, fast wi-fi, english speaking hosts and very reasonable prices. 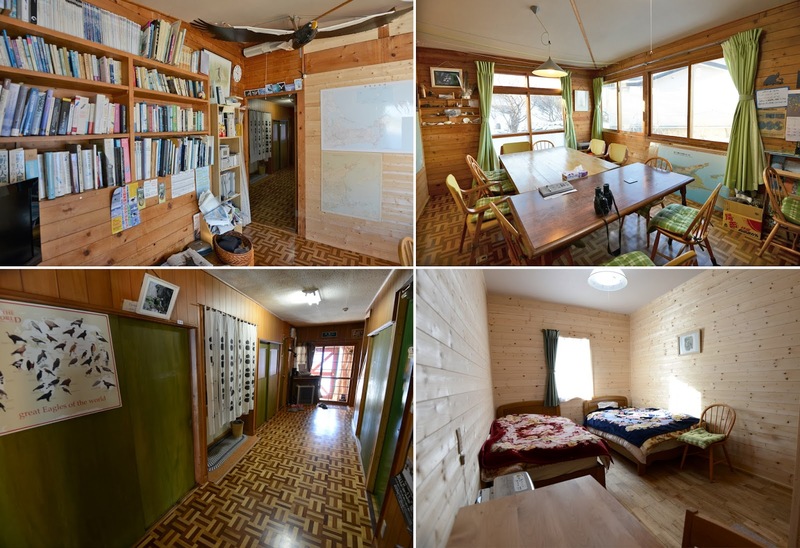 While several new guest houses geared towards birders are appearing, Takeyoshi Matsuo with his guest house Lodge Furen is one of the birder pioneers in east Hokkaido. We can certainly advice staying at Take´s place. Not only are he and his wife amazingly friendly people, but this is the place to stay for birders interested in the latest news from the field. Lodge Furen have been a favoured guest house for birders for a couple of decades! The sharing of information is great, and not to mention Take speaks english well. Above: A few photos from Lodge Furen. If you find time in between the birding, Take´s bird book library is well worth checking out! Rooms are very decent too. And they have wireless wi-fi with proper speed! Which is not allways the case in guest houses. 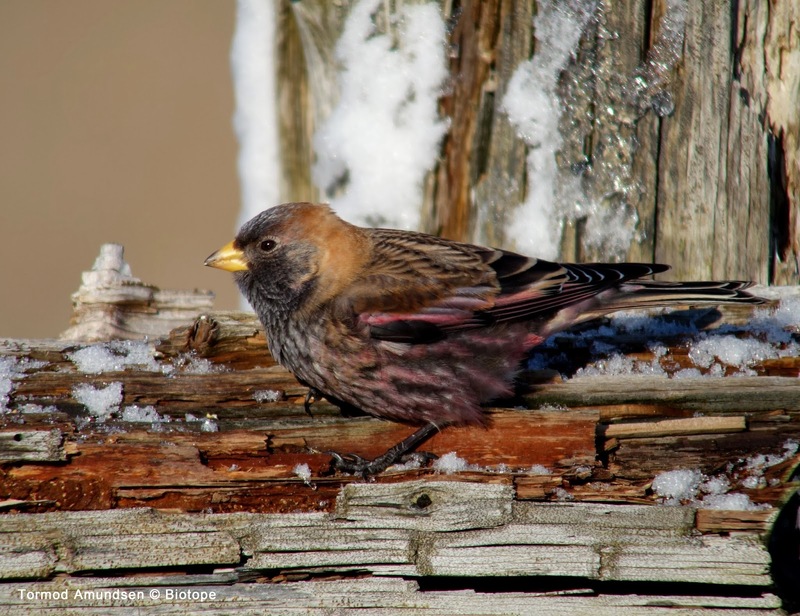 There are many birders who I´m sure have great memories from staying at Lodge Furen. 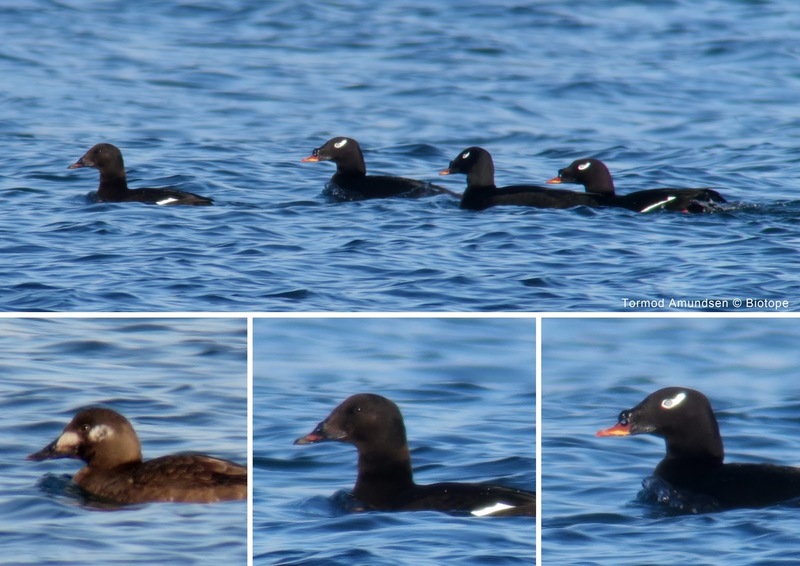 More Stejneger´s Scoters. Distant birds digiscoped at high magnification at Notsuke Peninsula, Nakashibetsu. Asian Rosy Finch - the passerine highlight of this trip. At Furen nature reserve. Smew at Betsukai Bridge - a very nice place for this species. Notsuke Peninsula - a very bird rich place. Loads of Steller´s Sea Eagles hang around this area. Digiscoping Steller´s Sea Eagle at Notsuke Peninsula. Frame filling views, with the Swarovski scope set at approx 45x magnification. After quite a few days exploring the fishing harbours of Nemuro Peninsula we had made a reservation for one night at Fujiya Hotel at Mount Shibetsu, just north of Nakashibetsu. This is a forest area with many rivers. The aim of this section of our trip was to see the worlds largest owl, Blakiston´s Fish Owl, and a few other specialities. Brown Dipper habitat: River streams of mountainous Hokkaido. We saw perhaps 20 of these very cool dippers as we drove around searching for another one of our main target species, the Crested Kingfisher. Eventually we did see the Kingfisher, but did not manage to get any photos. Nevertheless an amazing experience! 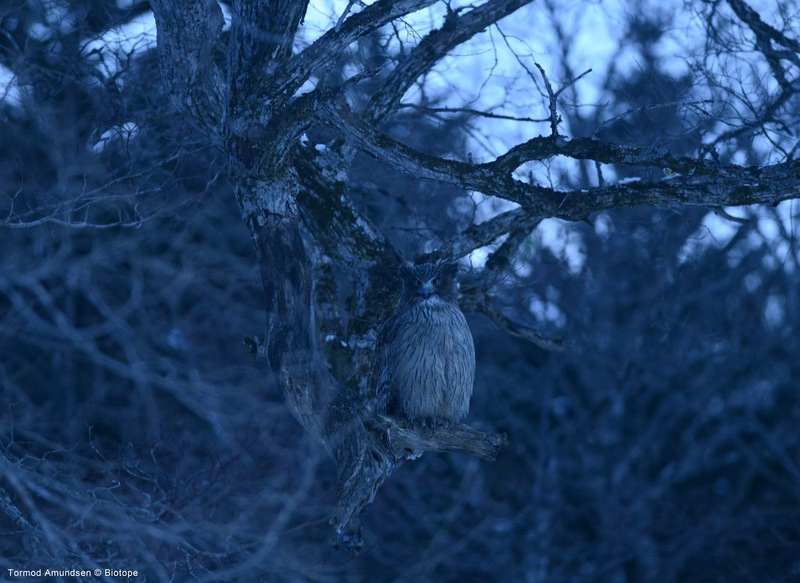 The Fujiya Inn (Hotel) specialize in Blakiston´s Fish Owls, meaning they have a pond with live fish that attracts the owls by night and in early mornings. It is a privilege to be able to get such close encounters with this world rarity! Grand thanks to Fujiya Inn for providing food for these birds, and for setting up a very comfortable ´photo hide´. The above photo was taken with the Nikon d800 & Nikkor 300mm F2.8. As the owls sat on the edge of the pond, I managed to do a series of digiscoped photos (both above photos). 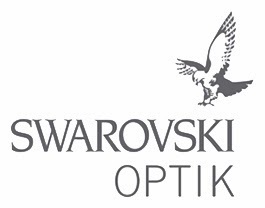 Biotope are very fortunate to be supported by Swarovski Optik with their finest optics for birders. Not only has this taken our birding experiences to a whole new level, even in our bird photography we can do much more! 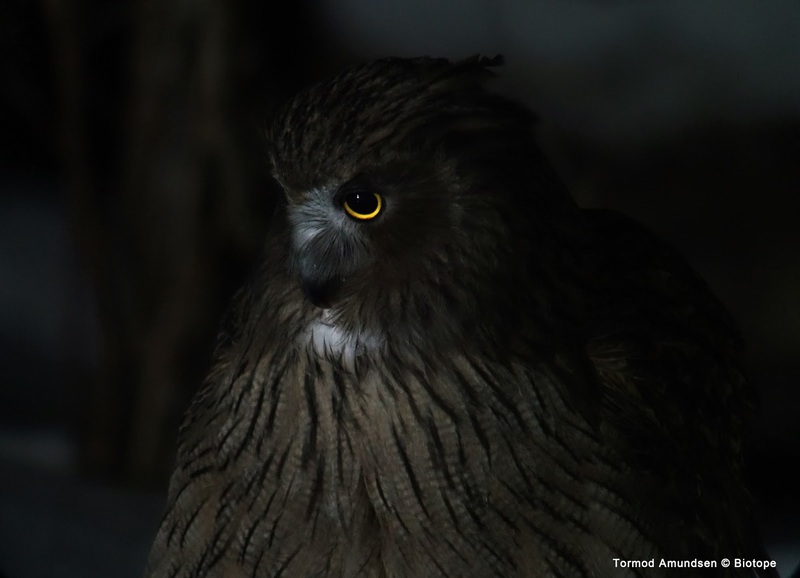 The fact that the above two photos of the Blakiston`s Fish Owl was taken with a compact camera is pretty cool. The following set up allowed this photo: the Swarovski ATX 95mm telescope with a Sony RX100m2 compact cam, set at iso 1600, shutter speed 1/4sec at F2.2, with the telescope zoom set at 45x magnification. In a pitch black night time scene only lit by a white light lamp. Pretty cool digiscoping! It is great to be able to so closely document one of the greatest and rarest owls in the world. Thank you Hokkaido, and thank you Swarovski! 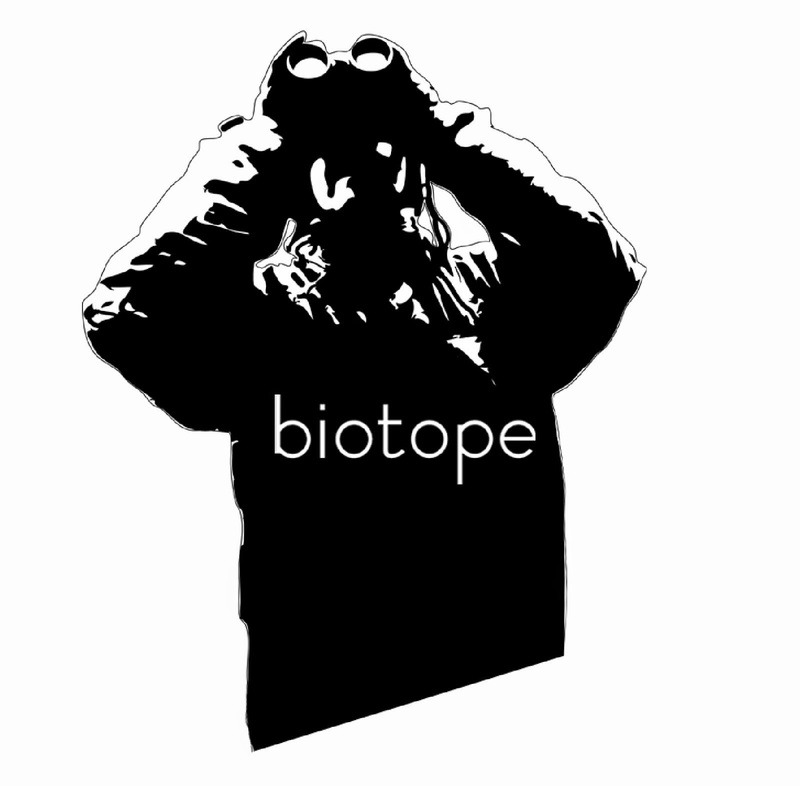 A full review of the optics will be available on www.biotope.no in a while. We still have more birding and digiscoping to do first. The Fujiya Inn (hotel) is a different experience from Lodge Furen: It is more expensive, much more formal, and in a more traditional Japanese style. They have an Onsen, which is a hot sping with both outdoor and indoor bath, and the dining is quite spectacular. They do not have wi-fi, but perhaps that is ok and makes you focus better on the entire experience. 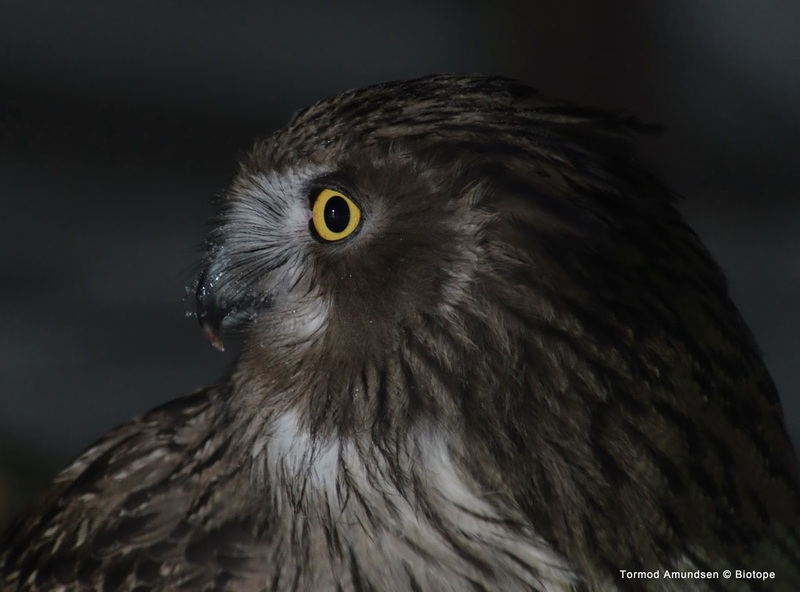 By night the Blakiston´s Fish Owl (currently there are 3 birds in the area) are calling. They have a TV-screen in the lobby showing a live camera views of the owl fish pond. They have a room you can stay in from early morning where you can photograph the birds through the window. There is no light og heat in this room, but still I would call this one of the most comfortable ´photo hides´ I have tried. No disturibing the birds, and chances of seeing them are very high. We stayed two nights and the birds showed up both nights. The first night at Fujiya Hotel also gave us a bonus species: a Japanese Marten. 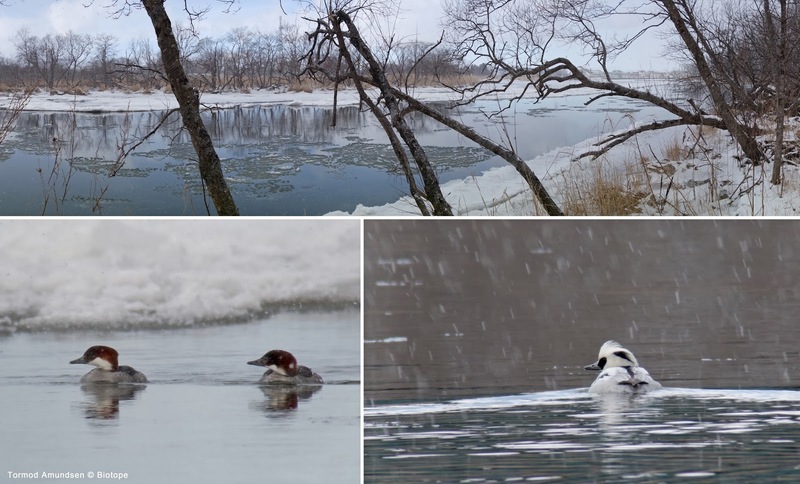 Since this trip report aim to give you an overview of winter birding possibilities in eastern Hokkaido, I figured I would add the above photos from 2011 too. They are from Rausu, in northeastern Hokkaido. We did not visit Rausu this time, as this place is better in February when the pack ice brings more eagles to the harbour. It is an amzing place too, with hundreds of eagles present, and no less then 5 (!) boats taking birders and photographers close to the eagle action (feeding them with fish scraps). 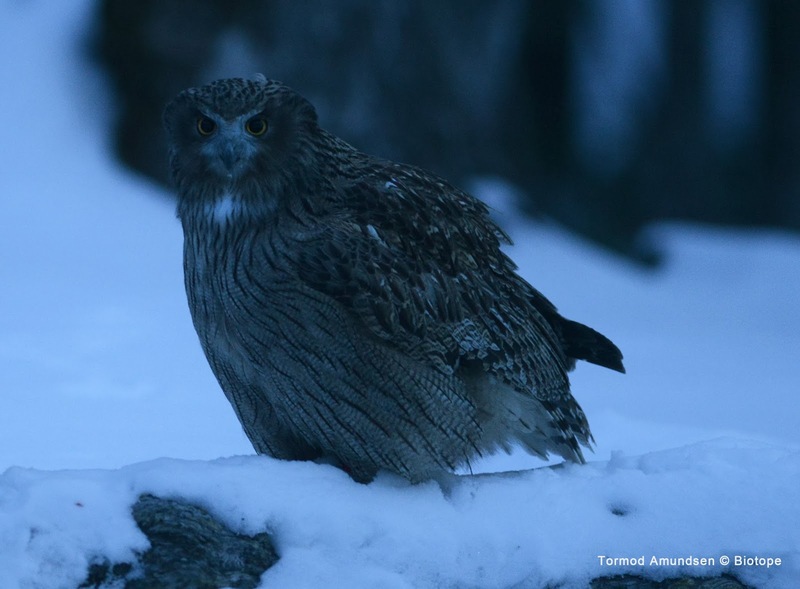 There are also a guesthouse in Rausu that feed Blakiston´s Fish Owls. Similar set up as Fujiya, with a pond, but I would say photo opportunities are slightly better in Fujiya. I must admit that there are huge potential for improving fascilities for bird photographers at both places, but that is not a complaint. It is simply remarking that they could take photo opportunities from very good to spectacular with some new bird photo hide designs. Japan is very densely populated in certain, but places like Hokkaido can sometimes even feel deserted. At least compared to the incredible buzz and traffic of places like Tokyo and Kyoto. 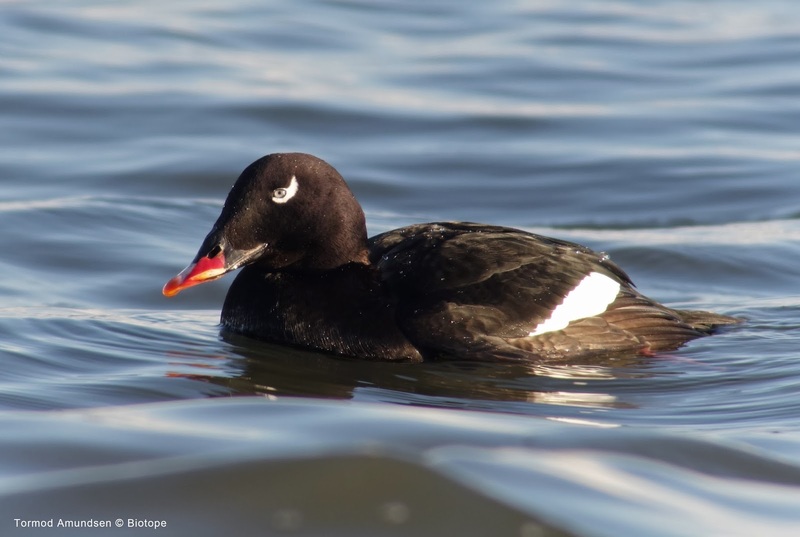 There are many great places to go birding throughout Japan, but we have outlined out Hokkaido experience in this trip report. Hopefully we will be back with more on birding in Japan, as we have visited a few places after spending nearly two months in Japan. There are a wide range of very cool species to see! If you can find a copy of Mark Brazils old guide book ´A birdwatchers Guide to Japan´ from 1987, you will find that this book are still very useful. Also there really is only one bird book to use when in Japan: again Mark Brazil have authored this one: ´Birds of East Asia´ from 2009, is an excellent companion in Japan. Lots of great info + the book even give an outline of subspecies status for many birds. A great resource! On our recent trip we flew from Vardø, Varanger and entered our direct flight to Japan in Copenhagen. We landed in Narita Airport, where we got on a bus to Haneda Airport (1 hour), for our connecting flight to Kushiro. This is the hub for all traffic in eastern Hokkaido. Once in eastern Hokkaido we have tried most of the transport options. Due to a mix up with our international drivers lisence, we did not get a car the first week, so do check that your authorities issue the correct international drivers lisence for you! From Norway the correct one to use in Japan is based on the Geneva agreement from 1949, not the Vienna agreement from 1968. In a way our little mishappening led to us getting to explore eastern Hokkaido by both bus, train, taxi, electric bicycles (!) and not to mention hiring Takeyoshi of Lodge Furen to guide us for two days. In the end we got our international drivers lisence by speed-mail and we where ble to explore eastern Hokkaido by car. We can very much recommend trying a bicycle holliday, as the bicycles you get come with an electric engine, making it very (or too) easy to bike up hill, but probably you are better off doing this in summer. We can also highly recommend hiring Takeyoshi for a day or two. He will show you many good bird sites, and not to mention share his knowledge of eastern Hokkaido with you. A great experience, thanks Take! Highlight areas we visited in Hokkaido was Lake Furen, Hanasaki harbor, Habomai Harbour, Cape Nosappu (for sea watching), Notsuke Peninsula and Mount Shibetsu (owls and more). I hope this trip report can be both usefull and inspirational. We certainly had an amazing time, and really hope to be able to go back some time soon. A summer visit would undoubtedly be very interesting. 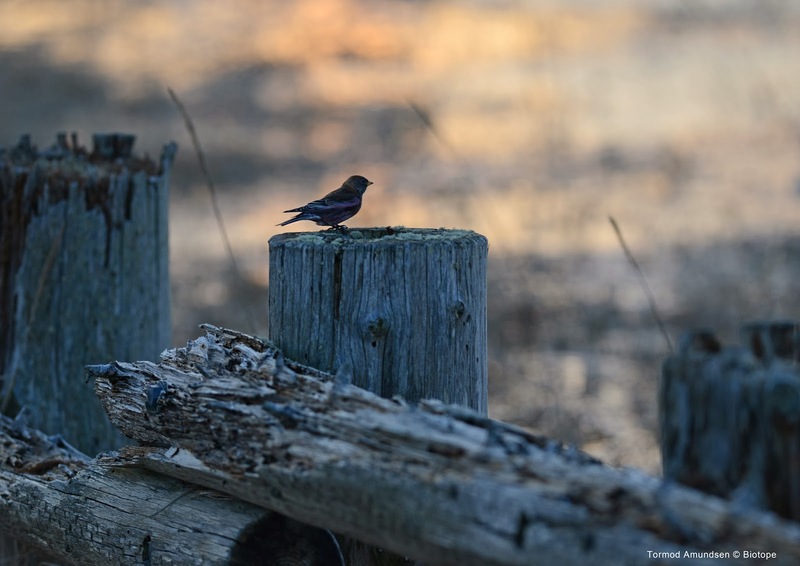 Revisiting a destination allways bring new understanding, and Hokkaido is the perfect destination for a couple of birder architects interested in birdlife, people, landscape and architecture in the northern regions of the world. Thanks Hokkaido! To be continued..